The Supreme Court ruled unanimously Monday that a convicted Alabama killer can pursue an appeal claiming that in his case, the state's lethal injection is cruel and unusual punishment. Justices said that lower courts were wrong to block appeals by death row inmate David Larry Nelson, who was less than three hours from execution last fall when the Supreme Court gave him a temporary reprieve. Nelson's case had given justices a stark look at how inmates are put to death. Nelson maintained that his veins — damaged by drug use — make it impossible to insert an intravenous line without cutting deep into flesh and muscle. The court was using Nelson's case to decide a technical question of whether last-minute appeals from death row inmates should be allowed in federal courts. 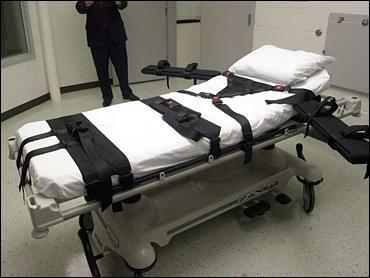 "This is not a ruling against the death penalty, it's merely a signal from the court that it wants to hear more from this particular death row inmate about how Alabama intends to execute him," reports CBS News Legal Analyst Andrew Cohen. "And a ruling in his favor could force other states that use lethal injections to execute prisoners to change the way they do it." Justice Sandra Day O'Connor, writing for the court, said that Nelson should be allowed to argue that his punishment would be unconstitutionally cruel unless special precautions were taken. Justices had been told in filings by physicians that if done improperly, the procedure could cause Nelson to badly hemorrhage and suffer heart problems before the deadly drugs kill him. Alabama attorneys maintained it was too late for Nelson to try to stop his execution, arguing that his case was a prime example of a sluggish justice system and the need for limits on appeals. He has been on death row more than 20 years. Police can search a parked car for drugs, guns or other evidence of a crime while arresting a driver or passengers nearby, the high court ruled. The high court has already ruled that officers can search a car when arresting someone inside, and the same rule now applies if a motorist or passenger gets out of the car. The justices agreed to decide if the government can force cattle producers to pay for research into cow diseases and for catchy ads promoting "Beef: It's What's for Dinner." For nearly 20 years beef producers have had to pay fees that are used to promote the industry, but lower courts have ruled that the beef programs  and others like them  violate the First Amendment guarantee of free speech. The justices agreed to referee a modern-day fight over state control of alcohol that recalls the days of Prohibition. The high court agreed to hear three cases involving state bans that prevent consumers from buying wine directly from an out-of-state supplier. The dispute pits states and an established network of alcohol wholesalers against independent wineries that want to sell their products over the Internet or by phone. The justices refused to consider the appeal of a retired Army Reserve colonel convicted of spying for the Soviet Union. George Trofimoff, who is serving a life sentence, filed his own appeal and told justices that his only crime was pretending to be a spy. He said in the appeal that the FBI was "successful in entrapping an old man, deeply in debt and desperate for help, with offers and promises of financial assistance."